One of the least well understood activities in growing a hardware or software business is the building of distribution channels. This looks very easy to the uninitiated, but in reality it’s extremely difficult. There are many subtleties that are far from obvious and some aspects that are necessary for success are downright counter-intuitive. Building a distribution channel strategy for your company is difficult in the best of circumstances when there are well-known exist channels for your product category. So how hard is it when there are no current, obvious existing channel partners already selling your category of products to start with? It’s very hard. In fact, many people in the know would likely tell you to forget about it and not even try. That might actually be pretty good advice, because this activity could easily become a real time & money sink if you’re not careful. But the other side of the coin is that this might be the circumstance where building a channel carries the very highest potential strategic payoff. One of the great truths I’ve discovered in my career is that the very most effective marketing and sales strategies are the ones that haven’t yet become mainstream in your marketplace. Once a strategy or tactic becomes very popular, the results become watered down until at some point it’s marginally attractive at best. 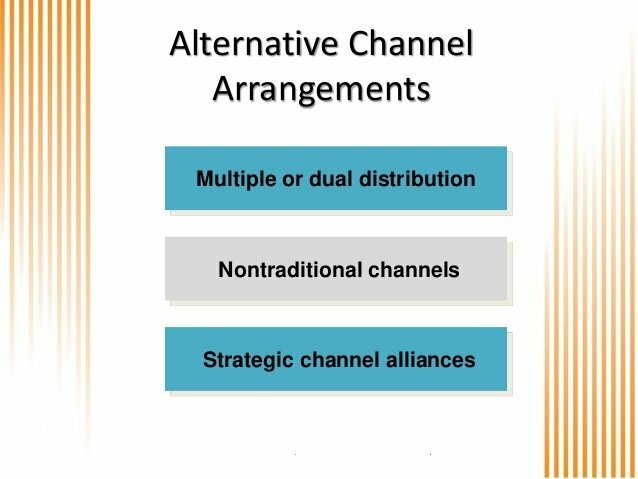 In terms of strategy, the move to try to “invent your own channel” fits in the “high risk, high reward” category. But the payback, if successful, is extremely high because it becomes a proprietary sales/distribution method for you with no competition (at least in the short or medium run). Because while it’s very difficult, if successful, you alone among all competitors in your segment will have the leverage and resulting strategic advantage that a well-executed channel strategy can provide. This is the most fertile place to begin, imo. The first step is to think strategically about what type of software application or hardware product is complementary to yours. Whose product might it make sense to integrate with your own, for example? These types of potential strategic partners might also have existing channel partners that might be interested in selling your product as a companion product. An example scenario that I recently successfully implemented for a client was an analytics software company that uses a lot of data to help forecast and mitigate decision risk. We were able to attract a number of channel partners in two adjacent software categories: Business Intelligence (BI) and Project Management. Both of these categories are large and have good-sized existing channels selling their solutions. BI creates a lot of data which could be used by my client’s software to forecast forward-looking actions, and the Project Management category involves a lot of complex decision-making and risk mitigation which was a natural fit for my client’s software. Potential OEMs are another great place to look for channel partners. One obvious possibility is hardware OEMs for a software company, where the software might be integrated with the hardware for a full solution. If the hardware OEM has a channel, Voilà! –you have a channel as well. Even if the hardware company isn’t interested in an OEM relationship, you might be able to entice them into a more vanilla reseller or strategic partner relationship with light or no integration so you can leverage their channel partners directly without having to approach them yourself. Lastly, you can always approach their channel directly (without the OEM’s assistance) to sell you product as complementary add-on product to the hardware or software vendor’s in the resellers portfolio. The first two categories above are pretty fertile with respect to creating a channel from scratch. After mining those two approaches, we’re getting into the area where you’ll need some really creative thinking. The first idea is former employees; I’ve seen many VARs who have started their systems integration business by specializing in their old employer’s products after leaving the mother ship. Another similar possibility is a former employee who lives in or moves to another country; they might start an entrepreneurial “exclusive” distributorship in that country. Very similar to the “Former Employee” category above is partnering with employees of former competitors whom you may know or come across. They will likely have similar knowledge and skill sets to your former employees, so the same type of potential applies. The only caveat here is you need to be careful of any existing relationships with your competitors, or other special agendas that could poison a potential relationship. Care must be taken when attempting to build a distribution channel with this potential partner category. This category of prospective partner is again very similar to the former employee and competitor categories in terms of potential. A user or former user who loves your product and who you have a good relationship with can be a good candidate for an entrepreneurial VAR/distributor startup, whether domestic or international. The area to be careful of here is that depending upon their functional background they may be very skilled in your product and some internal operating specialty, but may be poorly prepared to market, sell and run an overall business. This of course is a potential risk in both the former employee and competitor categories as well. These are some ways you can take the difficult step of creating your own channel from ground zero. Has anyone else tried this–what were your results? What are your ideas on how best to go about it? Please post a comment to expand the discussion. One alternative channel is called public cloud, which is ideal distribution channel for software and services. It allows cloud providers to provide value added services while contributing to bottom line significantly. Cloud distribution can be in multiple forms, be it IaaS, PaaS, or SaaS. Asia is growing fast in all those distribution channels. Marc, good to hear from you, it’s been a while. My experience matches 100% with yours with respect to selling software through hardware vendors (I’d extend this to nearly any OEM-type of partner). Yet it has been done successfully on occasion. You have to take into account the context of the article–creating a channel where an obvious one doesn’t exist–a difficult task. None of these suggestions fit into the “high probability of success” category. But if one works there can be significant payoff. Interesting topic, Phil. My experience selling software through hardware vendors has not been good. Unless the software is tightly tied to the hardware, sales people are not comfortable selling software, worry about extending the sales cycle and don’t push the product. Of course, with the right commission plan this hurdle can be overcome, but convincing your hardware partner to make the necessary changes can be challenging.